Hmmm. The master marketers at H&M are tapping into even me with their glorious films and photos. Dark Grey and Black are my go to colors and the Alexander Wang x H&M was my favorite collection. Didn’t think I would want anything ERDEM with all the flowers I’ve seen. But, alas, they put out a pretty rad looking film and I’m thinking of stopping by H&M on November 2nd 2017 to check the goods. Recently, I was consumed by the fast paced Biker x Raver Alexander Wang x Adidas Collection. Watching the video over and over, checking the IG every few days and next thing you know, I have a pair of Fluorescent Orange Kicks on my feet. They are super comfortable, but way too bright for me. Then I watch guys playing street ball in a PSNY Video and Now I have a pair of PSNY x Jordan 15’s, which are quite nice looking, yet nothing I should be buying with a credit card. Do videos, Film, IG pix get you in the mood to shop? It sure works on me. This film is done by Baz Luhrmann- He directed Moulin Rouge, Romeo + Juliet, The Great Gatsby, Strictly Ballroom and created the TV show The Get Down. The Film’s super models include: Saskia de Brauw, Imaan Hammam, Grace Hartzel, Fernando Cabral, Neels Visser and Tony Ward. The music is Hypnotized by Years & Years. See you on the Streetz or Maybe, Perhaps, I suspect at H&M on November 2nd! Iconic Super-Model, Naomi Campbell brings us the Fall 2017 H&M Collection. Naomi stars in the video set in Tokyo’s nightlife zone wearing many of H&M’s New looks for Fall 2017. Tokyo is definitely one of my favourite places. For the film, I was in a dark double-breasted trouser suit and it was my favourite look from the whole collection. Personally, I would wear exactly as it was styled – the tailored blazer was buttoned up, but you could see a little skin so it was a good balance of feminine and masculine. Naomi Campbell September 21, 2017. The Tune in the video reminds me of rap bands from the early 80’s mixed with some Scissor Sister’s vibe aka 2010. The Fall H&M 2017 collection is available at hm.com and in stores now. Scissor Sisters have been quite quiete over the last few years. Hopefully they will come back strong with a US/Europe Tour. A good sign is this new music from MNDR x Scissor Sisters with SWERLK 2017. After 2 listens, you’ll want to hear it again. Very Catchy lyrics. See you on the SWERLKing Streetz! Streetzblog has been tracking the November H&M collabs for a few years now. And this year, the November 2017 collaboration is going to be ERDEM x H&M. More than a bit, but a BIG departure from Alexander Wang and Balmain. ERDEM up until this collection has done Women’s wear with lots of flowing flowers. 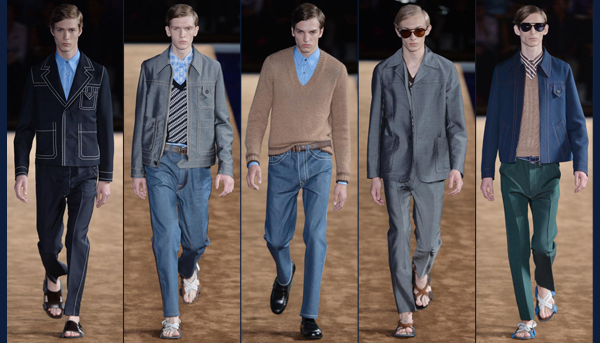 ERDEM says on the H&M website that yes, there will be menswear. What to expect? Maybe Tweed Jackets, flower power shirts, riding boots, jodhpurs? We shall see! The collection comes from the English Countryside. Not the City streetz of London. It would have been a good year for OFF WHITE x H&M to happen. Well, I expect we’ll see a dark blue with small red&white flowers hipster/Hawaiian short sleeved shirt. Been seeing many renditions of them lately. So, maybe H&M is on the right track. That shirt is super popular out here in Hawaii. When I think about it, these clothes will probably go well with H&M’s Coachella vibe, they’ve been doing over the last few years. I guess I shoulda’ bought more Alexander Wang x H&M when I had the chance. But with 2 credit cards, a debit card and some cash, I barely made it out of there without washing dishes. The clothes are great. The 2 pairs of shoes are way too big. But nice to look at..LOL *If you want a pair of the Mens Alexander Wang x H&M shoes, email me, I’m sure we can figure out a trade/cash deal. They are still NIB. What do you think of ERDEM x H&M? Me, I don’t quite get it. Or I keep forgetting that H&M also sells Women’s wear. And many celebrities wear the ERDEM clothes like: Emma Stone, Keira Knightley and Nicole Kidman. KENZO x H&M November 2016! Earlier this week, I was thinking it was just about time to hear what the new H&M Collab would be for November 2016. And Voila! Today/Wednesday May 25, 2016, Vogue.com reports that it’s going to be KENZO x H&M for November 2016. Official Hashtag is: #KENZOxHM The Women’s and Men’s Collection of ready to wear and accessories arrive in 250 H&M stores and on-line on Thursday November 3, 2016. Balmain , Alexander Wang (My Fav)-2014, Isabel Marent-2013, Marni-2012, Versace-2011, Lanvin-2010, Comme des Garcons-2008, Karl Lagerfield-2004. Also: Beyonce, David Beckham and Viktor& Rolf. See you on the Streetz and at H&M in Waikiki on Thursday November 3rd, 2016. I hear a bit of a NIN riff in this vid. See if you can pick it up? I’m thinking this is gonna’ be more of a female oriented release than the Alexander Wang x H&M collection. And the gear or should I say apparel feels much more gaudy than last years AW release. Not sure yet what to get, but I will be in line for the excitement of the release. See you on the streetz near H&M in Waikiki on Thursday November 5, 2015! The Hype is heating up for the Balmain x H&M collection. The September 12 Balmain x H&M Update wasn’t too long ago, when we received a great glimpse of the Men’s collection. Now we have some of the looks shot by famed fashion photographer Mario Sorrenti. As seen on some pretty hot models/celebrities including Kendall Jenner, Gigi Hadid, Jourdan Dunn, Dudley O’Shaughnessy and Hau Yun Xiang. When you love the Balmain world, you love the models that are part of it too. Kendall, Gigi, and Jorudan are my friends , and they are the perfect choice to star in the Balmain x H&M campaign. Olivier Rousteing, Creative Director of Balmain Paris. 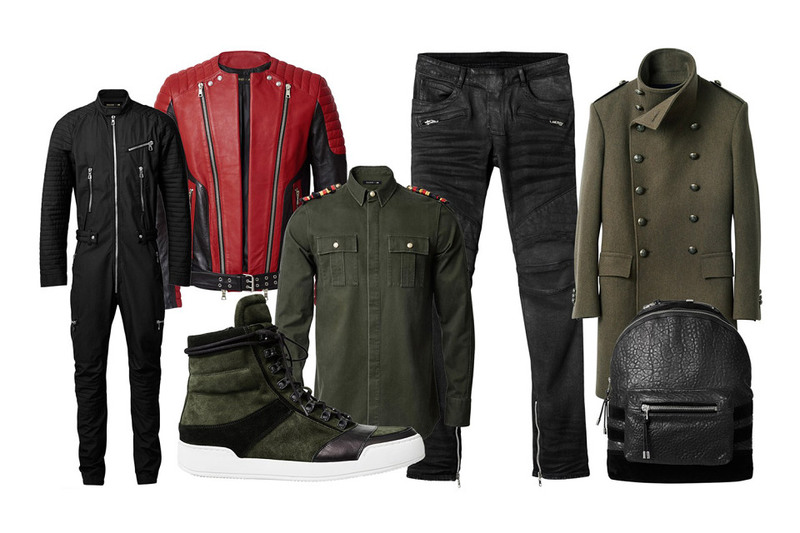 The Balmain x H&M collection releases in store and on-line on Thursday November 5th. Time to start saving some $$. I’m expecting some good deals because it’s with H&M, but Balmain is typically pretty pricey designer swag. Check back with Streetzblog, We’ll continue to cover the updates and will be there in line live tweeting on November 5th. Might even try some perescoping If I’m awake enough. In 2014, Streetzblog had a very fun time tracking the Alexander Wang x H&M collection, from Rumor, to Men’s and Women’s first looks, to even shopping early in the morning for the goods. This year, it’s Balmain who is doing the H&M Collab. Seems the clothes took a while to appear, but here they are! At least some of the guys gear. Looks to be a lot of Military Green, some black and wow a Michael Jackson inspired leather jacket. From what I’ve seen from Balmain’s main label, some of their clothing has too much accoutrements and bling to be wearable, unless you’re a Rock or Movie star. This collection, so far, looks pretty wearable. My choices in order are: The Green Pea Coat, The Kicks, The textured backpack, the black pants with the zippers, and the Military shirt. I doubt I could wear the black jumpsuit or red leather jacket anywhere I go. Overall, pretty wearable and the quality is looking spot on. Projected date for the collection to be in store and on-line is Thursday November 5, 2015. Thank You to Highsnobiety’s Balmain x H&M info for the picture. And thanks to British GQ for the original picture, where you can also check out an Interview with Balmain’s Creative Director with Balmain’s Creative director-Olivier Rousteing. See you on the Streetz of Honolulu this week. December 18-21 in NYC and Dec 22-27 in Chicago. Here’s your one-stop shop for Spring Trends 2015. I wonder how they compare with the trends predicted by the Runway shows in Milan and by Streetzblog.com in July 2014? All in One Snapshot of the Spring Trends for 2015. Photo courtesy of Prada. Men’s Trends (From the H&M Spring Chic Magazine 2015) *List inspired by their list with streetzblog editorial. Seventies Workwear: Fashionable take on 1970’s utility Styling mixed with functional fabrics like raw denim. Utilizing expert tailoring to make this trend look just as good on the weekends and at work. Summer Neutrals: Subtle shades of beige and gray. That Beige is driving me a bit crazy, not at all a fav of mine, but even though 50 Shades of Grey didn’t live up to all the hype, the color grey is marching into Spring as the number one color. Artistic Knits: Designers like Raf Simons and JW Anderson have updated the tank top with tapestry-like scenic landscapes. You also might want to check out your local Thailand or Tibetan shop to score some items of similar yet different aspects of this trend. If you’re going to wear a tank top, make sure you have your suntan lotion on or wear it at night. You don’t want to have that extremely funny tank top tan line, it’s just as bad as forgetting to button your fly all day. Italian Riviera: You may have heard that the 70’s, 80’s and especially the 90’s are big now. Well, this trend takes us back to the 50’s with lightweight preppy styles including the piped polo look shirt and striped golf jackets. Now, it’s really time to find a friend with a yacht! Premium Parkas: Tailored rather than functional. A more formal and luxurious look for Spring layered over a suit. Sounds a bit warm to me, but depends on where you may live this will work or won’t. Basically lighter, groovier jackets for spring ala Parka. If you had a Winter like most, you may not want to wear a jacket as long as you can. Me, I can’t wait to get back to NY in December to rock my Alexander Wang x H&M Scuba hoodie. I did get some good mileage out of it in NY, but gotta’ tell you if you have scuba material jackets, use them in Spring. they really are’nt meant to keep you warm in the Winter. 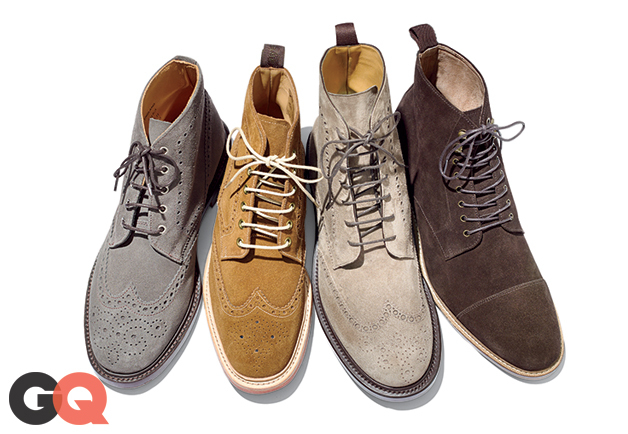 Dress Boots: Wing Tip or Cap-Toe. In grey, beige, brown or be a bit more daring and go with the blue or green. My favorite work shoes at the moment are’nt suede, but they are a nice deep Navy pair of hi-tip wingtips. Comfortable and go with most of work clothes and my blue watch. Whether you go leather or suede, just make sure you match your shoes with your outfit before walking out the door. It’s not too pleasant to make it all the way to work and find out you need to hide in your cube all day, because your funky blue or green boots don’t match anything you’re wearing. And even worse, getting called into the bosses office on a day like this. Be especially careful on Mondays. Desert Boots: These look very comfortable, yet I’m still holding out from purchasing a pair. They are updated in luxe suede, fun colors, rubber soles in crazy contrasting colors. They just remind be too much of 1978, when I refused to wear them. For some reason, these just don’t scream Stylish. But if they are really comfortable, I’d give them a try. LMK if you’ve rocked them and had success? Chelsea Boots: These crack me up, because every single season for the last decade, the trend setters are telling us to wear a pair of Chelsea boots. This time in suede. They can look pretty stylish especially when done in a wing tip brogue or a duo tone ombre. You really can’t go wrong with a Chelsea boot, they worked for everyone from the Beatles, to Lou Reed to Harry Styles. I succumbed to the hype and bought what I thought were a fairly inexpensive pair of rubberized Ferrigamo Chelsea boots in brown. But WOW, they hurt my feet worse than anything I own. Maybe the suede is the way to go. More flex. If anyone wants a pair of brown Ferrigamo Chelsea boots in size 10 LMK. Work Boots: This is a tough choice. GQ claims not to worry and scuff them up. I have a very opposite view of suede boots. To only wear them on a perfectly great sunny day. And on a day that I wont be walking in too much dirt or rocks. For some reason, out of all the materials, I think these look best, nice and un touched. Even in a work boot. I guess that’s why I own only one pair of suede shoes. They can be hard to clean. Probably the best shoe to take to the shoe maker to trick out then a DIY project. For sure, don’t slap some gooey polish on em’. Streetzblog Spring predictions *As seen on the streetz, the web, magazines, and in my mind. The Dull Colored Chino: Lighter fabric, colors in bland blue, off Pink, rusty Red, Beige, and Green. These are the more comfortable chinos, they are also the kind that wrinkles easier, so don’t try and wear them 2 days in a row. Fitted, yet not too skinny and no we are not in the boxy 80’s style…yet. For some of us over a certain age, the 80’s boxy style will make you look even older even if it does come back like the Women’s Mom and Men’s jean trend. Be careful of trends. If you like the way it looks on you, wear it, no matter what we say here or you read anywhere, if you don’t feel good in your new trendy outfit, don’t bother. Ripped Jeans: Especially for women, get the versions with the biggest holes and most rips. It’s Spring, time for some nice spring breeze to inherit your legs. And this Summer, get ready to cut them a bit above or below your knee and wear them tailored selvage or totally Mad Max ripped out of control. The Black Motorcycle Jacket: Seems to be the must have piece for 2015. 70’s, 80’s, 90’s: Wow! It’s here that it gets confusing. Depending on what or where you read something these decades are all in. From what I can tell, 70’s are best for Coachella cool, 90’s are the it decade now, and the 80’s are fading, yet the day-glo and neons especially bright Yellow and Ultra Pink are here to stay especially for the athletic chic vibe. Cotton Candy Hair: From Dull Pink to washed out blue. If you’ve seen it at the cotton candy stand at the fair or on the runway, this is the It color, especially for females. Guys? Are you ready to rock these fun colors? Watch out for more platinum blond shades, thanks to: Kim K and Jared Leto. Tiny Floral Prints: Big and bold was last year’s version. This year, looks like the flare of the flowers and fauna are getting smaller. Yet still a huge hit amongst the fashion forward NBA stars. Black, Blue and Grey: If you don’t know what to wear today or tonight. Just pick out colors from these, combine and get out of the house. These are awesome, reliable year round’ look great colors. If you want to be really on trend, go with the dull green, dull light blue or even the (yuk) beige/khaki. Health Goth, AthLeisure, Avant-Bland, Fly-Girl, Retro-Chic, and the NoTrendTrend. I’m thinking next blog post will be dedicated to the Health Goth look. Fun name and lots of great designers doing it. Rick Owens, HBA, Alexander Wang to name a few. See you on the Streetz. Cotton Candy Colored Streetzblog logo. The Grand Palais in Paris was full of celebrities, it-girls and supermodels as H&M showed their A/W Women’s Studio Collection. Super Style Swankster and Music Producer Caroline de Maigret was lucky enough to wear a custom silver jumpsuit, then DJ in a specially produced space pod doing a live DJ-Set that gave the good vibes to the catwalk show. Upbeat, fun music lead the way with this stylish collection. Not far behind was the star-studded audience of Solange Knowles, Noomi Rapace and one of my favorite actors of the moment: Audrey Tautou. If you haven’t seen the movie Amelie, be sure to see it. A very Beautiful Day, positive, full of surprises, slightly Avante-Garde, very french portrayal of one women’s Quest for Love. If you’re feeling a bit down and out, it’s a really great pick me up-kick in the pants, get out of your pity party kind of movie; great for a rainy Sunday afternoon. Audrey is also known for Mood Indigo, The Da Vinci Code, La Delicatesse, Dirty Pretty Things and of course, Coco Before Chanel! Super Models at the show included: Kendall Jenner, Gigi Hadid and Edie Cambell dressed in a combination of hipster 70’s influenced tie-dyes and a futuristic Apres Ski sporty collection. The Apres Ski styles remind me of an Audrey Hepburn movie I recently watched on TMC entitled Charade. It’s a pretty good movie, but the real star of the show are the fashions which are out of this world, I bet it was on the mood board for this collection. Seems like we’re due for an announcement from H&M on a November H&M x (insert designer here) collaboration. 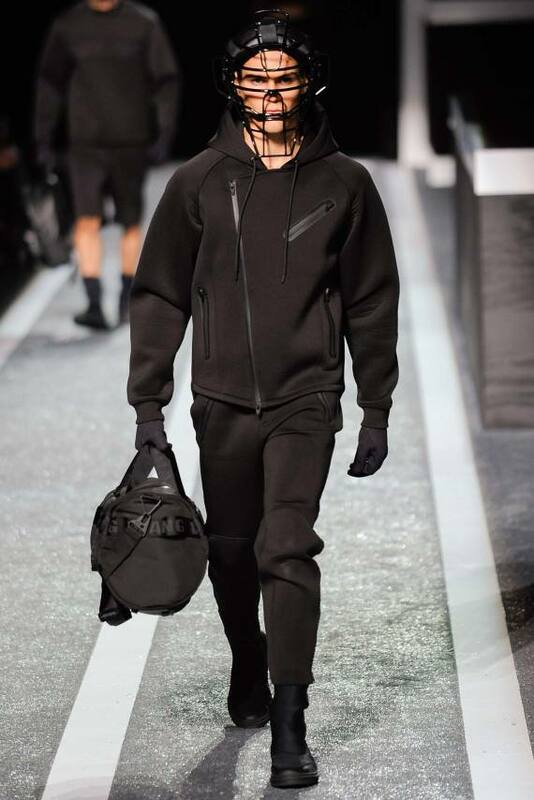 My vote goes for another Alexander Wang Health Goth #2, his regular line is very nice, yet quite expensive. I would like this to be the collab, yet highly doubt this will be the announcement. Just hope it’s a duo gender friendly collection. Both Target and Uniqulo’s latest collabs have been 90% female based. Men are due for some Sassy & Stylish famous designer fast fashion soon. Such a fun week to live in Hawaii. Thursday Morning 5:00 a.m: Alexander Wang x H&M collaboration goes on sale on-line. 7:10 a.m 37th in line at the H&M Store in Waikiki. 8:00 a.m. Everything goes on sale. The Scuba style Jacket was number one on my list and I was lucky enough to nab the only one hanging in the store. It’s a bit big, but should be fine in NYC in December. Yes, I got caught up in the hype partially from these 2 Alexander Wang x H&M pictures. They got me good. Thursday Night 8:00 p.m: Jimmy Choo Waikiki Grand Opening Celebration. Attendees dressed up beyond anything I’ve ever seen in Hawaii. The ladies were all in very colorful Versace, Valentino, Calvin Klein and many other designer name brands. With bags from Louis Vuitton, Tory Burch, Michael Kors, Coach, and Prada. Beverages and Food included: Comp Martinis and Champagne with Asparagus/Gruyère Canapes. Good thing it was too busy to shop, I really don’t need any more kicks at the moment. And I’m on one of those shopping fasts until 12/17/14. Friday Night 5:30 p.m: A big goal for me and maybe for you is to get to NY Fashion week sometime. This year, Honolulu did a Honolulu Fashion Week. So, I signed up to volunteer. On Friday night, I was one of the Ushers at the Art of Fashion: The Best of Neiman Marcus and the Kini and Dinko Spring Summer 2015 Runway Shows. It was quite fun, I helped people find their seats, saw many people I haven’t seen in years, met some new friends, saw a bunch of people I only see on Social Media and got to see both shows up close and personal. Here’s some pictures from the Runway Show: The Art of Fashion: The Best of Neiman Marcus. These are courtesy of Matt a fellow usher who knows how to take a nice picture. And Wow! This cracks me up. Every time I watch a Runway Show on the internet I can’t believe how many people use their phones to take pictures from the front rows of the shows. And guess what? I used my iPhone 5s to take pictures of the 2 Runways shows. In one respect the shows were so good, I’d love to share some real pictures of the exquisite designs. In another, some of these are pretty trippy. I didn’t filter or edit any of them and the models some how look like ghosts or like their image was taken away via Photoshop and replaced by WHITE. Let’s just categorize them as art and that should work. Super nice post show festivities included the opportunity to get a picture with Kini Zamora. Kini is from Kapolei, HI, He did extremely well at Project Runway Season 13 and along with Dinko Satto, he designed and produced the Kini and Dinko Fashion line. The collection was very good. Sporty-Chic, utilizing similar scuba style neoprene as Alexander Wang x H&M. Also had some other nice fabrics, vibrant whites with blacks, and exquisite draping. And to my surprise, Kini and Dinko had both Men’s and Women’s clothing. I’m sure you can find some nice pictures from the show by Googling Kini and Dinko Hawaii 2014. There were many pro photographers at the show. There’s only 3 of these Hawaiian Airlines bags in existence and Cora and I sure had fun fighting over it. Note: Of course we gave it back to the owners. They were really nice and took the pictures.